My great grandfather and grandmother Sivils, with my Grandma (bottom right) and her sister, circa 1937. I was visiting with my grandma (we call her Nanny) a while back and we got to talking about her mom (my Grandma Sivils) and 11 siblings growing up during the era of the Great Depression and how they'd learned to get by with very little. She said the kids didn't really ever have treats or cookies or anything like that but in the summer they'd go pick wild blackberries and my great-great grandmother would bake thin sheets of pie crust and stack them 10 or 15 layers thick with the fresh smashed blackberries sprinkled with a little sugar and the whole thing drizzled in fresh cream. Not whipped cream because they didn't have a refrigerator so cream was never cold enough to whip. I loved the simplicity of that dessert and I felt inspired to create my own version. Knowing my parent's backyard explodes with TONS of blackberries in August, I knew I had to file this idea away for later. And here we are. I hope you enjoy my version! Seriously so easy (even the crème anglaise, promise!) and the rustic stacked look gives the dessert an instant nostalgic vibe. This is the perfect fuss-free Summer dessert. To make the pie dough, combine the flour and salt together then cut the butter into the mixture using a pastry cutter or a food processor. Once the mixture resembles coarse crumbs, add in the vinegar and drizzle a few tablespoons of the ice water over the mixture. Add more water as necessary until the mixture just comes together to form a ball. It's ok if its a little crumbly, you don't want it too wet. Wrap in plastic wrap and chill for at least 2 hours in the fridge before using. I like to just make it the day before. Preheat the oven to 375 degrees. Cut the chilled dough into four equal quarters. Roll each one out into a rough round disk, about 1/4 inch thick. Lay each out on a parchment-lined baking tray. Brush them with the half and half and sprinkle each with a tablespoon of raw sugar. Bake for about 20-25 minutes, until golden brown. Allow to cool while you prepare the filling and crème anglaise. Place a medium bowl over a larger bowl filled with cold water and place a stainer inside the medium bowl. Set aside. Whisk together the egg yolks and sugar in a small bowl. In a small saucepan, heat the milk on low, until the milk is just warm, but not bubbling or simmering, about 5 minutes. Remove from heat. While whisking, slowly pour the warm milk over the egg yolks, until the two are completely incorporated. Pour the mixture back into the saucepan and cook over medium heat for about 5 more minutes, stirring constantly with a spatula or wooden spoon, until the sauce has thickened slightly. This is the only real tricky part of this sauce. If you let it cook too long, the sauce will curdle. It shouldn't be too terribly thick so it happens quicker than you think. The consistency you're looking for is somewhere between liquid heavy cream and a pudding. It should still be drippy and pourable. As soon as it coats the back of your spoon, remove from heat and pour through the strainer into the chilling bowl. 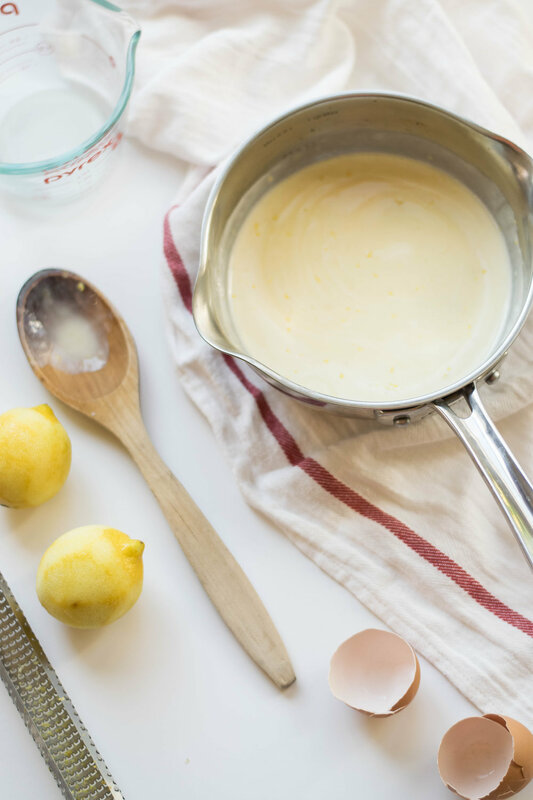 Zest the lemons directly over the crème anglaise, catching all the essential oils cause flavah! Transfer to a jar to chill in the fridge until ready to serve. 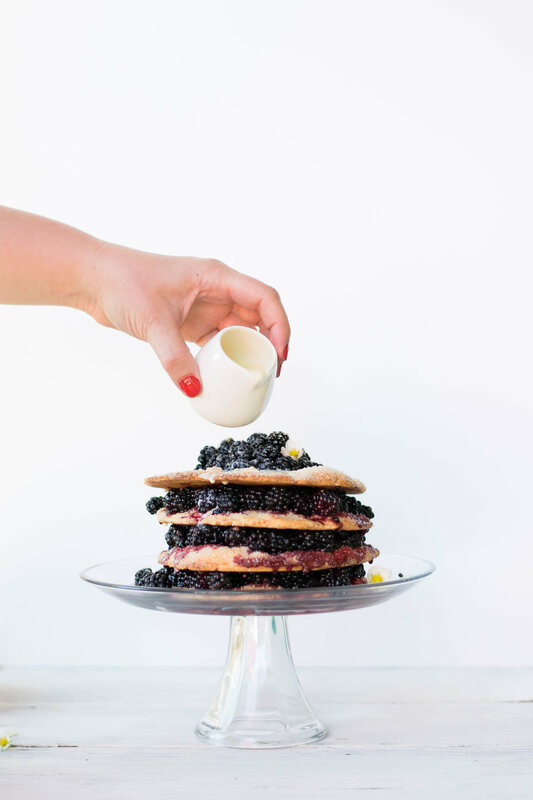 Incorporate the vanilla bean into the sugar first, then sprinkle over the berries and toss to combine. When ready to serve, assemble the pie by placing a pie round on a serving plate and top with about 1/2 c of the berries, and repeat with each layer. 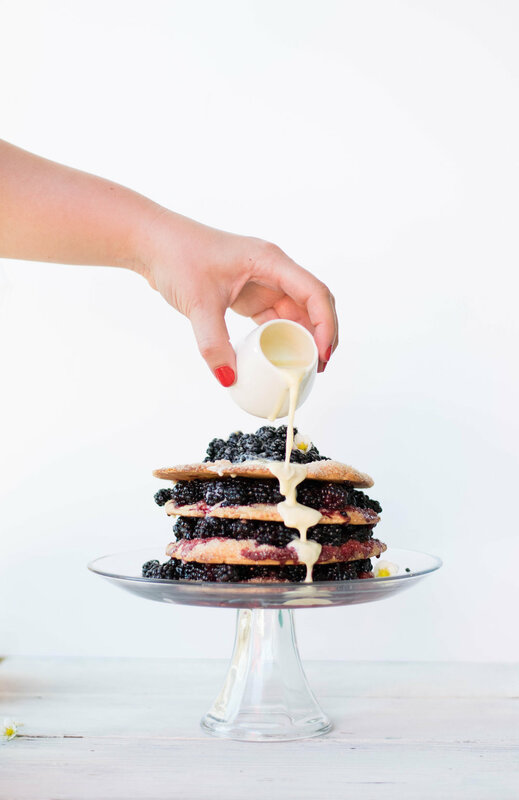 Drizzle with the crème anglaise.